Gluten-Free Living > Tips > What should I make for Sunday dinner tonight? What should I make for Sunday dinner tonight? 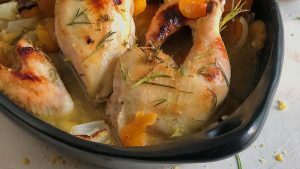 Consider this flavorful Apricot and Rosemary Roasted Chicken. There is something comforting and satisfying about an easy-to-make yet pretty-to-present roasted chicken in the cooler months.